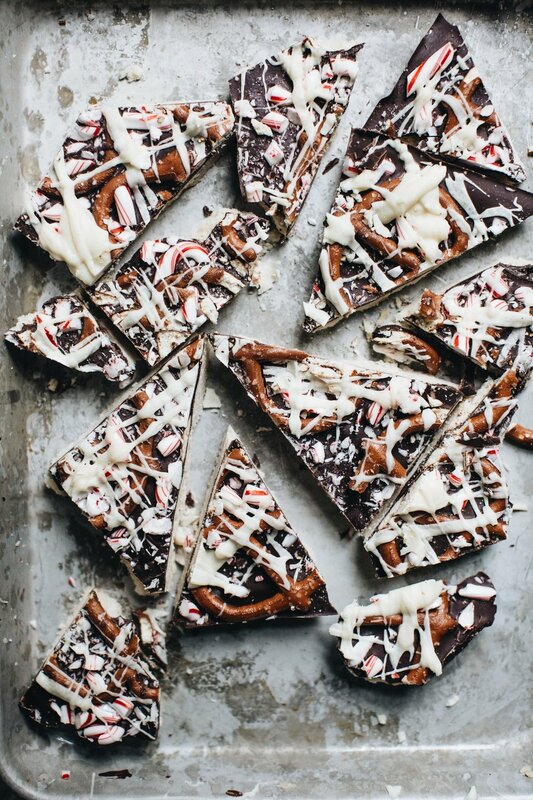 This is one of my favourite baked treats during the holiday season - buttery shortbread, smothered with dark chocolate, topped with smashed up candy cane and pretzels, and scattered with white chocolate. It's the perfect sharing treat to take to parties, full of Christmassy flavours, and a real crowd pleaser for adults and kids alike. Preheat oven to 165˚C / 325˚F. Line a 10 inch x 12 inch slice tin with baking paper. In a food processor, whizz the flour, rice flour, sugar, vanilla extract and salt together in a few short pulses. Add the butter and process briefly, just until the mixture starts to clump together. You can also do this step by hand, by rubbing the butter into the dry mixture with your fingertips or a pastry cutter. Pour the mixture onto your bench top and knead it just once or twice to gather the loose crumbs. Press the dough into the prepared pan. Place it in the oven and bake for 10-15 minutes, or just until the shortbread is starting to turn golden. Watch it closely so it doesn’t burn or brown too much. When ready, remove from the oven and allow it to cool completely. Place ¾ of the semi-sweet and bitter-sweet chocolate into a dry, clean glass bowl. Melt the chocolate by microwaving on high heat for 30 seconds, stir, and then microwave again for another 30 seconds, until the chocolate is just melted. Add the remaining chocolate and stir until smooth (if it isn’t fully melting, microwave on high for another 15 seconds). You can do this by placing the bowl of chocolate over a saucepan of just-boiled water and stirring intermittently until melted. Pour the chocolate evenly all over the cooled shortbread base. Arrange the pretzels over the chocolate and sprinkle over MOST of the smashed up candy canes. Save a little to sprinkle over right at the end. Melt the white chocolate using the same method as above. Once melted, stir in the peppermint extract (if using). Take spoonfuls of the white chocolate and flick it back and forth over the pretzels to create a criss-cross pattern. Scatter over the remaining candy canes. Allow the chocolate to set – this will take at least 2 hours or longer. Once dry, cut into squares or triangles.